For Love Or Money: Fans And Businesses Flock To Fantasy Sports The legal loophole that allows people to bet on fantasy sports teams but not real ones is attracting big money. Fantasy games may trump real ones soon, says commentator Frank Deford. 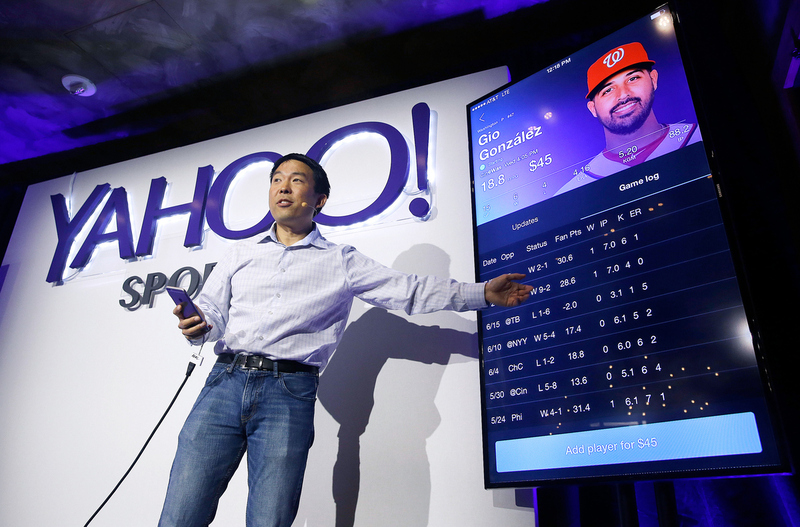 Kelly Hirano, vice president of engineering, demonstrates the Yahoo Sports Daily Fantasy contest during a product launch in July in San Francisco. Yahoo has designed this experience for the mobile fantasy player and offers Daily Fantasy, Full Season Fantasy, and real-time sports news and scores as an all-in-one experience. In the famous Disney movie, a carpenter named Geppetto longed to have a son. He carved a puppet of a boy, and, wouldn't you know it, the wooden Pinocchio magically became a real child. Fantasy games are the Pinocchio of sport, for all who play them become Geppettos. Isn't it the dream of every fan to construct his or her own team, as Geppetto wanted to carve out a son? Fantasy sports allows you to do that. You draft your own players for your make-believe team, and then you bet based on how your real players perform in real games. But then, we call that fantasy. According to federal law, it's legal for you to bet on your make-believe team when it plays other make-believe teams, but you cannot bet on real teams when they play other real teams. The rationale is that in selecting players for your team — let's say the San Francisco Giants — your analysis of baseball qualifies the activity as a game of skill. But you can't legally bet on the actual San Francisco Giants as an entity, even though you would be applying the same skills to evaluate your wager. It isn't just fantasy sports, it's fantasy jurisprudence. But it is hardly any dreamland. Fantasy sports are now estimated to be a $2 billion business in the U.S., with 57 million players. Each year the numbers explode, with more serious investors happy to broker the action. Just this month, Yahoo threw in big-time to fantasy sports, booking games every day. It's no fantasy that Yahoo will bank 10 percent of what they take in. To make it even more bizarre, while professional sports leagues all have taken hysterical stands against changing the federal law — which prohibits gambling on actual games — the sanctimonious leagues also have partnerships with various fantasy sites. The word fan was originally carved out of "fanatic," but now it would more properly be identified with "fantasy." You have to wonder, with a lot of fans, if fantasy hasn't already begun to trump reality. A fan may root for an actual team, but it's only an emotional attachment. With his fantasy team, he's put cash on the barrelhead. Ah, for love, or money? Pinocchio eventually became a real boy. Geppetto's fantasy beat reality. If the popularity of fantasy sports keeps growing, someday we may play real games just to support our fantasy habit.